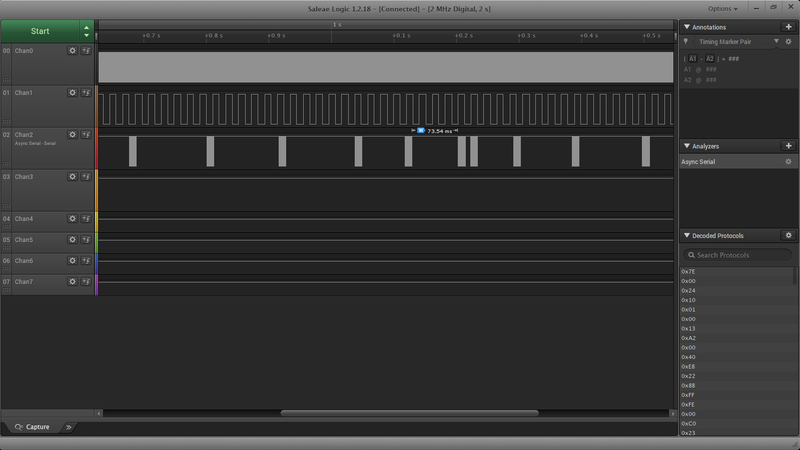 I got all of the firmware straightened out and this works pretty well now. This particular software build only handles DCC addresses 0-99 but I’ll be fixing that on the next firmware upgrade. You only need this one board and it will enable the Protothrottle to control all of your Airwire Locomotives. 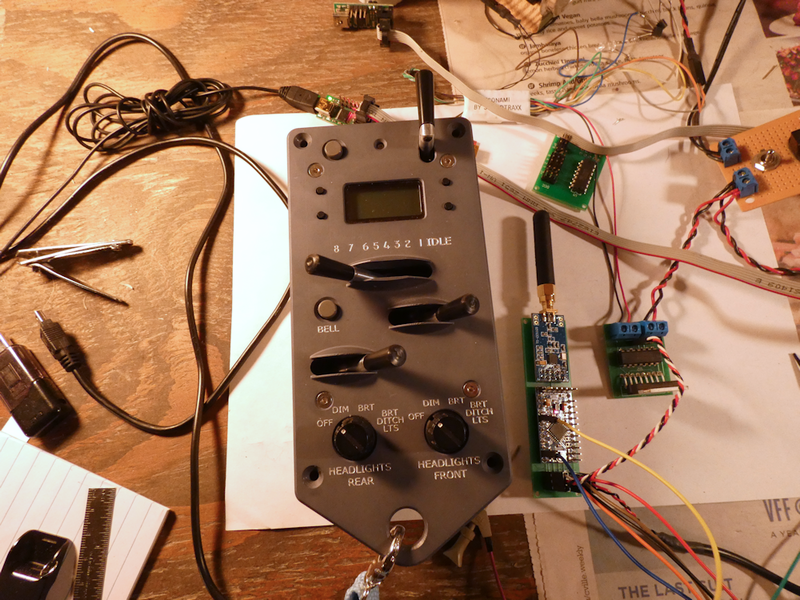 It still needs another pass on the PCB and an enclosure but I’m pretty happy with the innards. 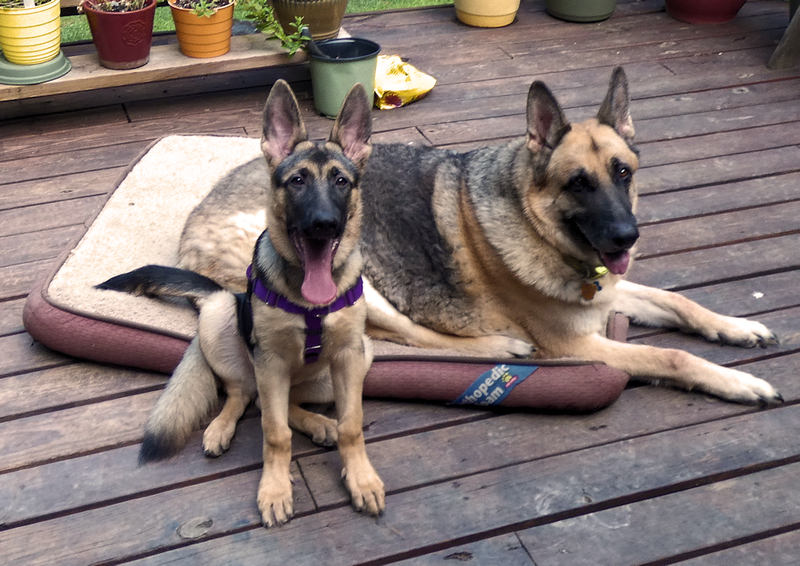 I’m going to build up a few and see if anyone wants to do some beta testing for me. UPDATE 3/11/19- Now in Beta, I have the full 4 digit addressing working. I thought I would post an update on my system progress. Above is a shot of the Protothrottle and the node configuration screen. I’ve got this almost finished, I only need to add some refinements for the servos in order to do live steam or in the case of diesel DCC locomotives, control the front and back couplers. 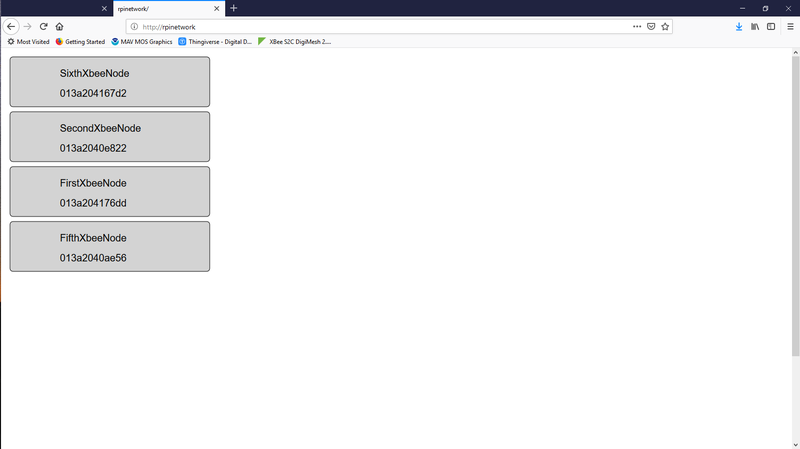 I’ve tried to keep this very simple, above is the main page when you connect to the RpiZero web server. 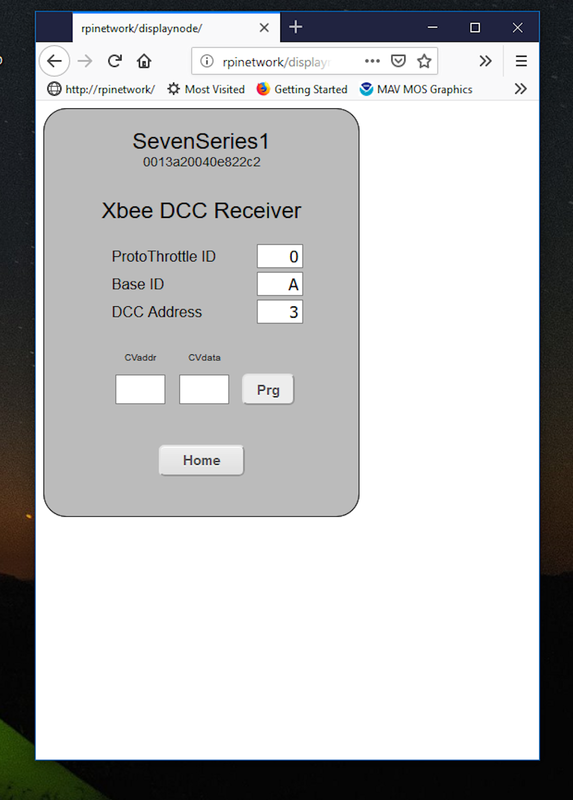 You can click or touch the ‘scan’ button and all of the Xbee devices on the network will be queried and saved. You can then click any of the nodes to ‘zoom in’. 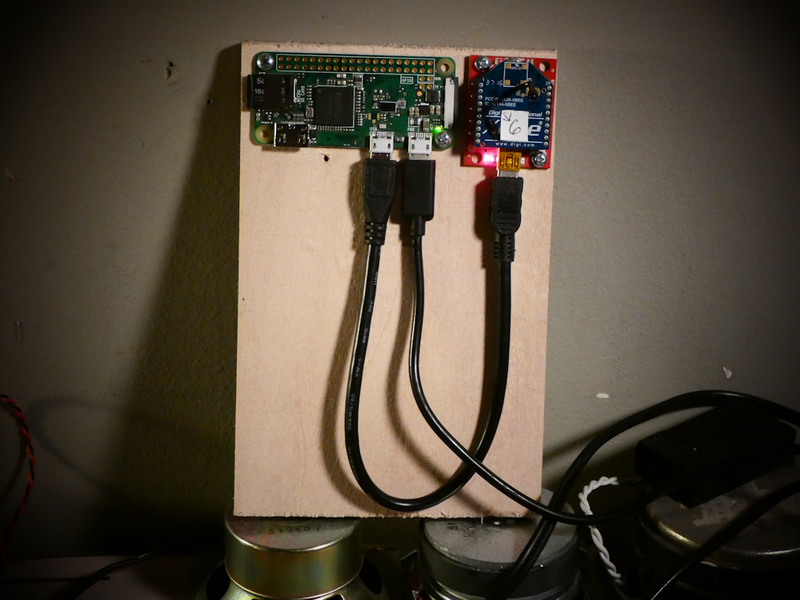 Each node will support a DCC output and servo outputs. I run both diesels and live steam so I am building in servo control for both. 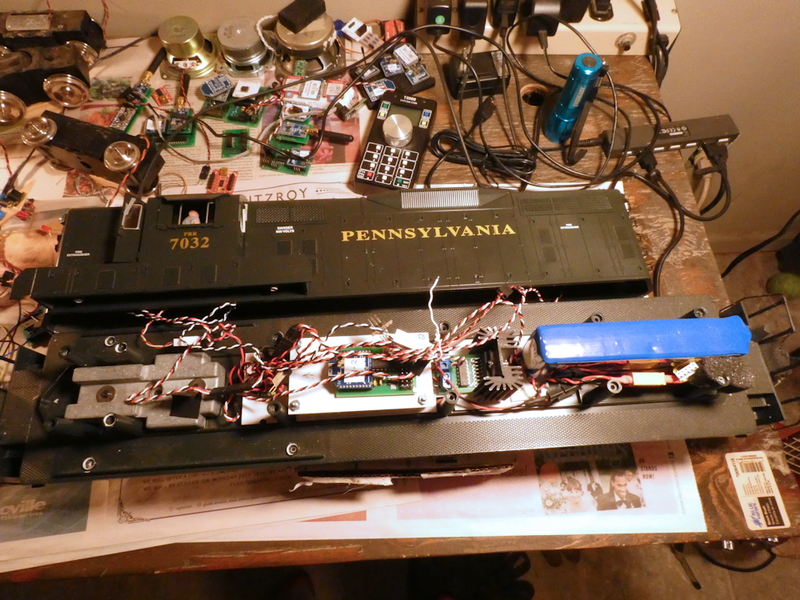 ‘Diesel mode’ will be used to control the two couplers on a battery DCC locomotive. ‘Steam mode’ will allow the throttle and direction controls on the PT to move servos in a live steam locomotive. Here is a shot of the main node configuration. 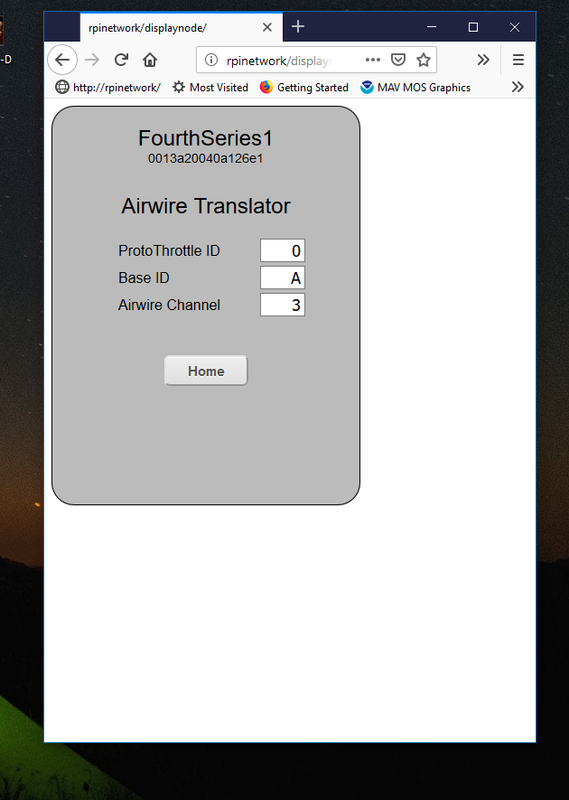 There will be another screen when I get my ‘Airwire Translator’ working but that’s a whole other project. I do have the basics for that coded up and prototyped but it will be a while before I get that one together. 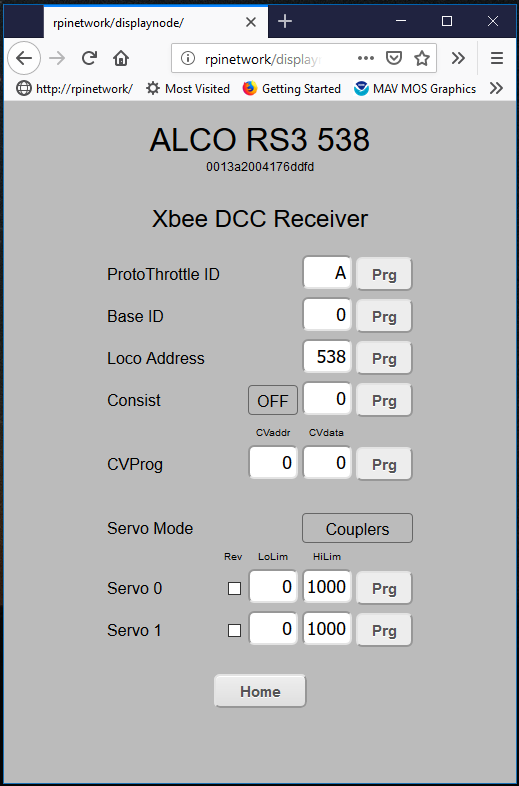 Anyhow, a few specifics on the parameters- the Protothrottle ID and the base ID are pretty much fixed unless you want to run multiple combinations of protothrottles- the Xbee DCC Node looks at both of these values and they have to match or the message is ignored. Below the Loco Address is the consisting setup. You can set consisting to OFF, FWD or REV and then enter the address of the lead locomotive. If anything other than ‘OFF’ is set here, the Xbee node will respond to the consist address and ignore it’s own address. Since the Xbee message is broadcast to all locomotives at the same time, this gives you unlimited consisting. Below the Consist setup is the CV Programming parameters. Enter any CV Address and data into these windows and press ‘Prg’ to send a CV programming command to the locomotive. At some point I will expand this to include english language setups for both the Soundtraxx TSU-4400 and the TCS Wow 501, but for now this gets the job done. Next is the servo setup. There are two servo modes, ‘Couplers’ and ‘Steam’. Couplers (servos) can be assigned to the DCC function codes to open and close them. This is not completely implemented yet, but the hooks are there. In ‘Steam’ mode, the Protothrottle throttle lever will be passed to servo 0 (taking into account the low and high limits) so that you can control the speed of a Live Steam Locomotive. 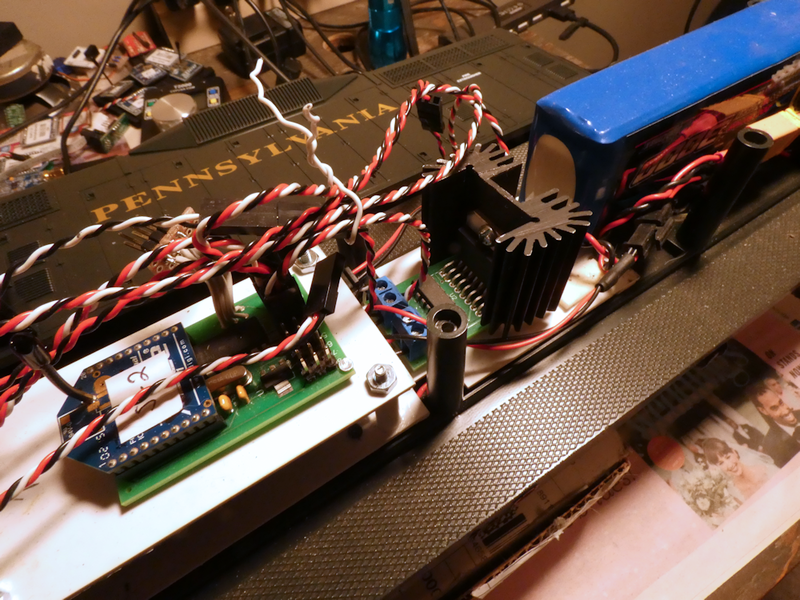 The second servo will then be used for direction control. For both of the servos, regardless of the mode, you can set a reverse and a high and low limit. So, that’s about it. I will be installing all of this in a couple of my locomotives to do some ‘real world testing’ once the weather improves a bit and spring rolls around. I have two of these for the time being (one is a loaner from iowa scaled), so I am putting some cycles into developing a web app to handle the Xbee network these guys inhabit. It is way cool how the Protothrottle backend works. It sends out broadcast packets to every Xbee on the network but leaves a huge space for directed messages. In light of that, I’ve come up with this minimalistic setup to send those directed messages. Super simple hardware. 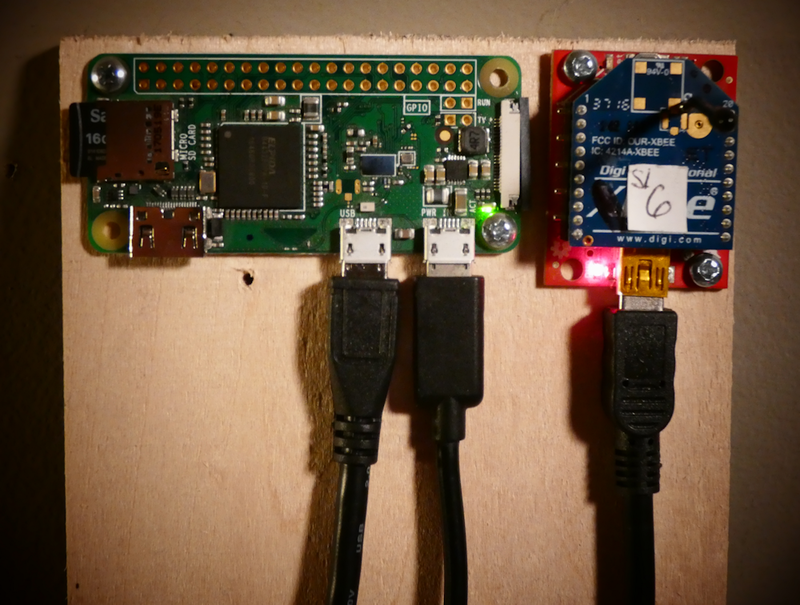 A Raspberry PiZero W, configured as a Wifi Access point with an Xbee as a USB device. It’s running Apache web server and Python Flask on the backend. I’ve thrown in MySQL and reddis (database apps) and created the basics for a web app. Because of the way linux works, I need a background process that runs as root that actually talks to the USB/Xbee. (the web app doesn’t have access to the hardware) I run two reddis queues so the web code can build the messages and then the root process can receive and send them. Took a while to get that working right but it’s doing quite well now. Everything starts at powerup. I like stuff to ‘just work’ when you turn it on. 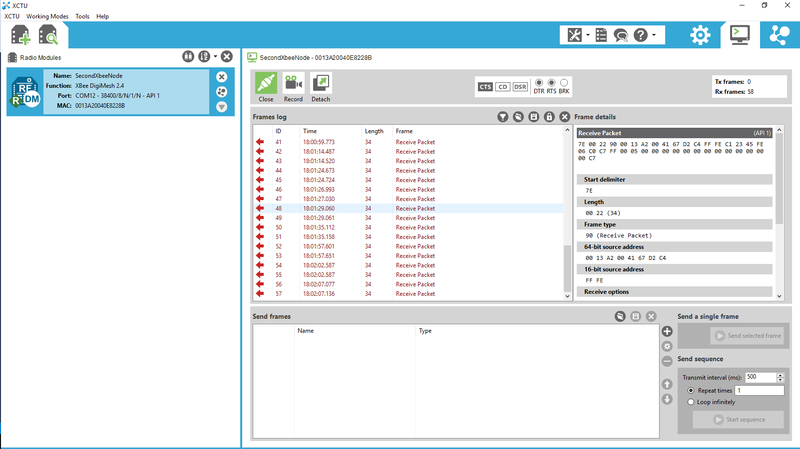 Using this interface, I can scan for all the nodes on the xbee network and then direct specific message packets to each using a web based interface. Or in other words, I will be able to configure a DCC decoder in a locomotive with my smart phone while I control it with the Protothrottle. Way cool! 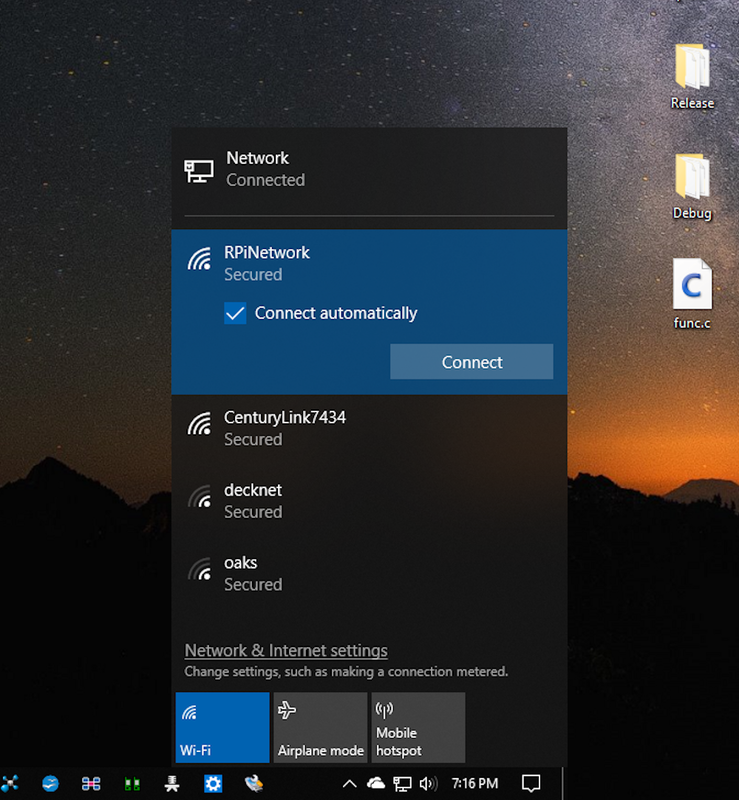 Above is how the Windows PC sees the RPiZeroW, it’s just another Wifi network. Once you join here, the RPiZW (linux) handles all of the DHCP and DNS stuff so you can use any browser to get to it. Below is the console login using windows 10 bash. 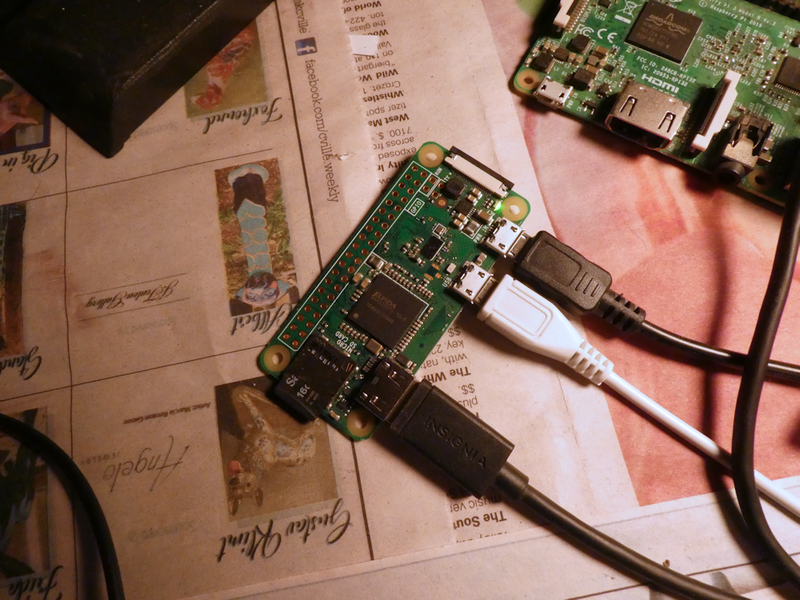 You can just ssh into the Rpi, just like a big ole honkin web server box (even though its only as big as two postage stamps, ha) As you can see, all of this is over Wifi, I have no hardwired ethernet. Below is Firefox, note the URL. It needs some cosmetics, kinda bland, just a very basic graphic for each node. I can click the ‘scan’ button to find all nodes on the network, then I can click on one of the node graphics to ‘zoom’ into the receiver. Two of those screens are below. For now I only have the basics, but I will, in time, come up with graphical interfaces for the TCSWow and TSU4400 so I don’t have to lookup all those darn CV doodads to change things. Thanks to Craig Townsend and Iowa Scaled Engineering, I now have one of these to play with for a bit. First look and it’s doing Xbee pretty much like I thought- I’m already seeing traffic from it. I’ll be integrating this into my own receivers plus working on a translator to drive Airwire devices. However, tomorrow (1/1/2019) is my last day of break so it will take me a bit to get everything refactored. I have the basic framework up and running on my development boards but now I have to interface the Protothrottle packets into my message handlers. Should be fun! 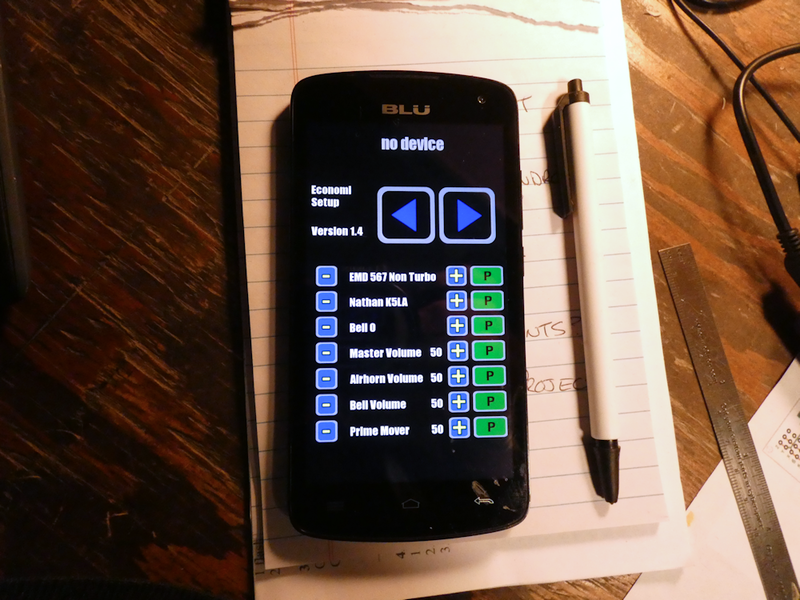 The phone will do it all now, I can also drive the train with the phone if I wish (probably not) plus I can setup all the other DCC parameters like the engine choice, the acceleration/decel, brakes, etc. All with plain text and pretty colors. Can’t beat that. 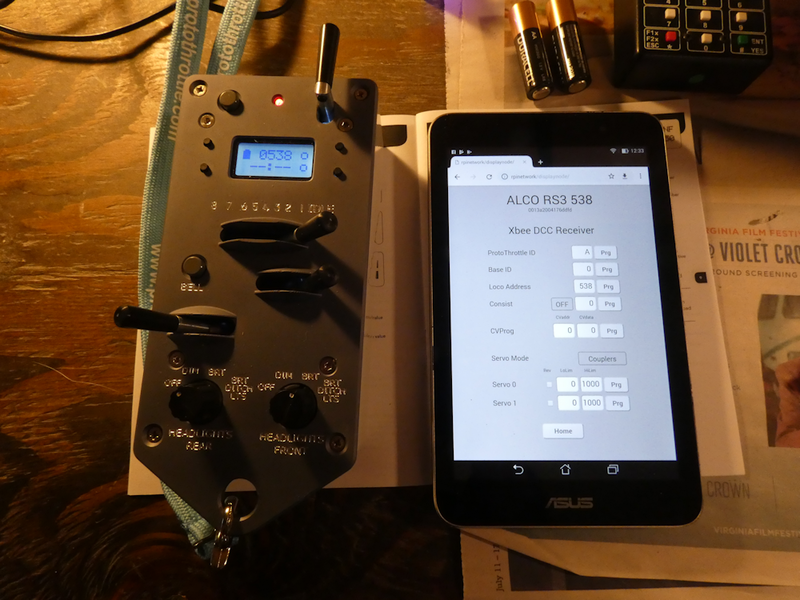 I do have to add some parameter entries to the phone like the Airwire Channel number and the DCC address, but I’ll get to that soon. Above is the bluetooth/airwire transmitter side. For the most part, this is a complete design. The PC Boards require just a couple of tweaks but they are in good shape. 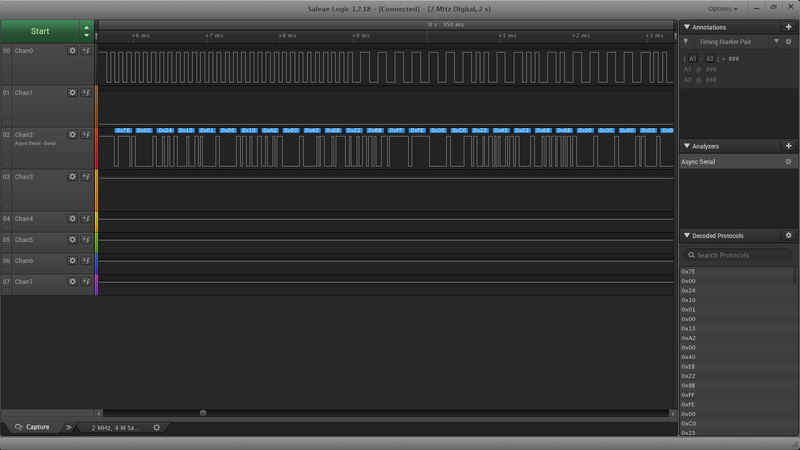 I’m using the Bluetooth chip to intercept commands from the phone and then translating those into a logic level DCC stream. That feeds directly into the CC1101 radio modem which then talks to the Airwire receiver. This is the receiver side. 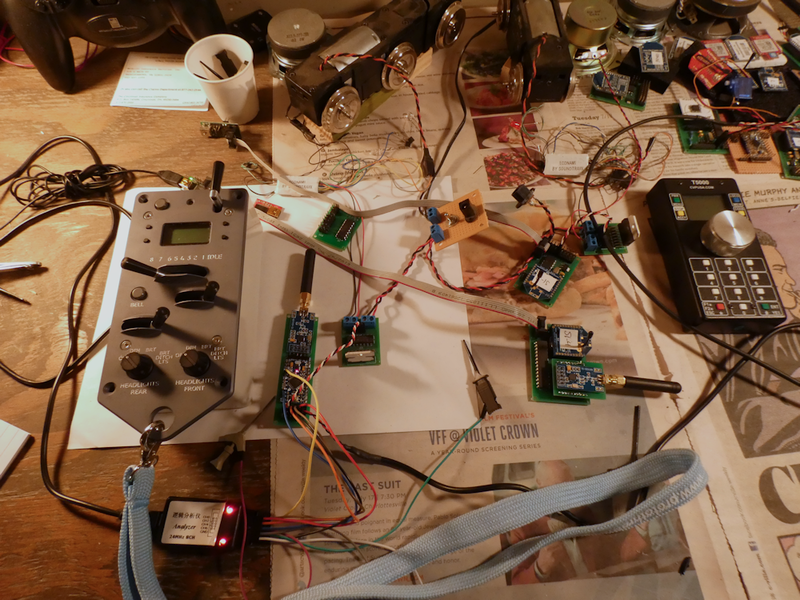 At the moment it’s just adhoc on the breadboard but I’m also working on a couple of smaller receivers. 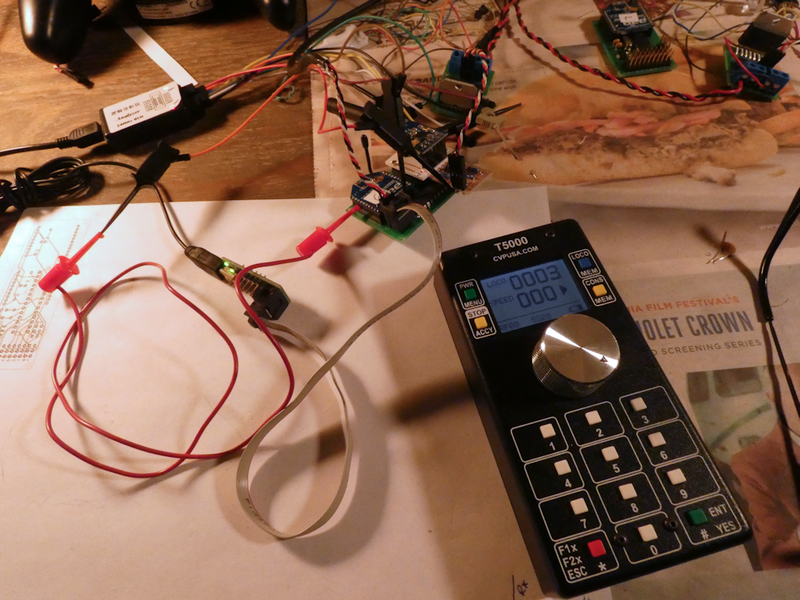 The DCC amp at the end combines the Battery voltage (or in this case, wall wart for testing) and changes the logic level signal into ‘real’ DCC. 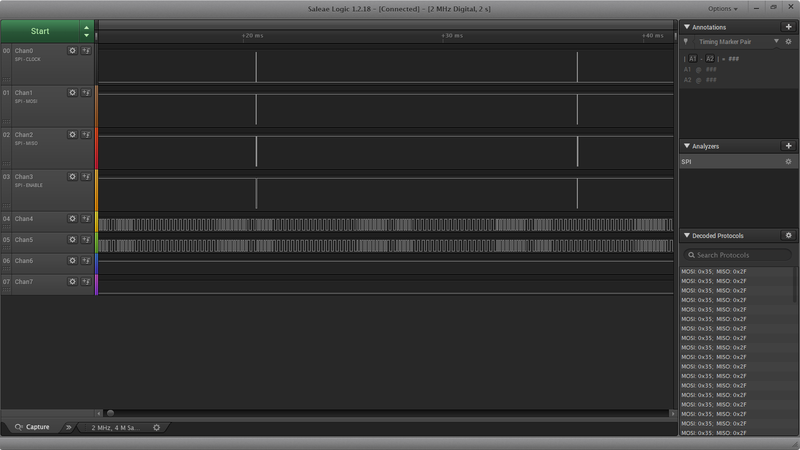 This drives an Economi (Soundtraxx) 2amp Decoder. The soundtraxx is just for testing, this will eventually be going into a GP38 with a TCSWOW 5 Amp decoder and 3300mah Lipo. 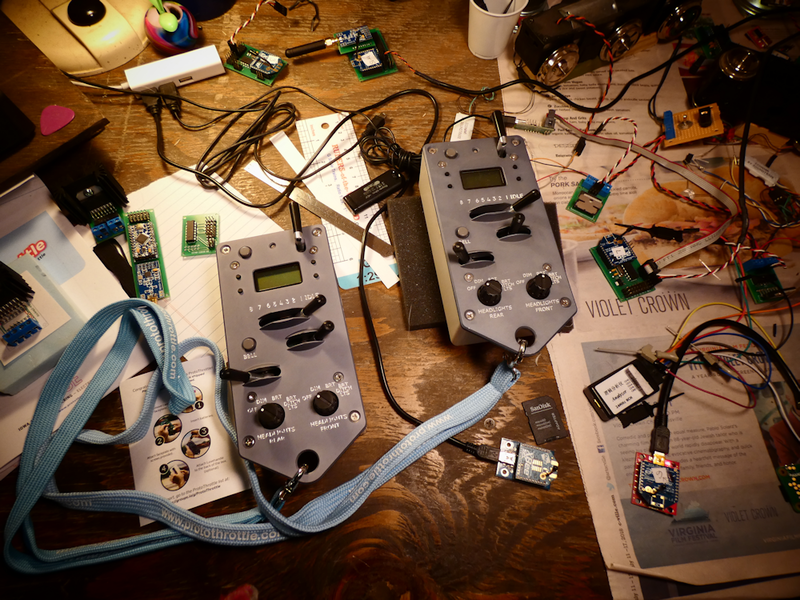 Anyhow, below are two of the receivers, one is the ‘deluxe’ version which contains a complete Arduino ProMini board, and the ‘minimal’ which is an Attiny24 design. These also are complete boards. The Promini design can be altered with Arduino Studio, the smaller one is not programmable, you use the jumpers to set the Airwire Channel. 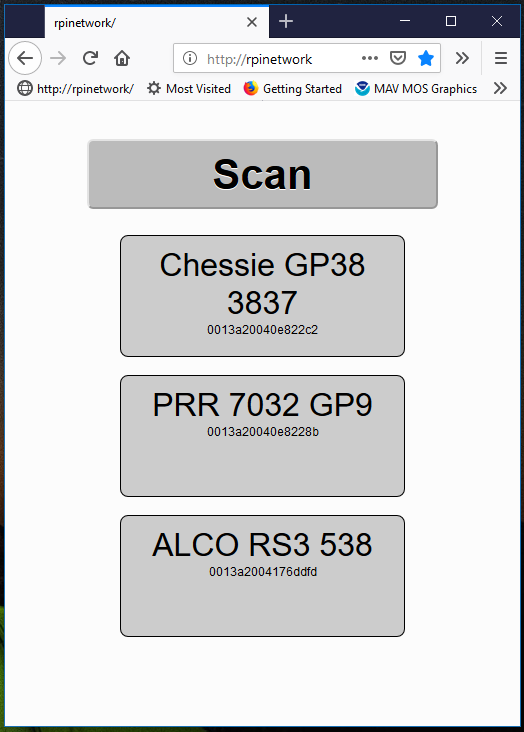 Here are a few images of the logic analyzer and what’s going on between the devices. 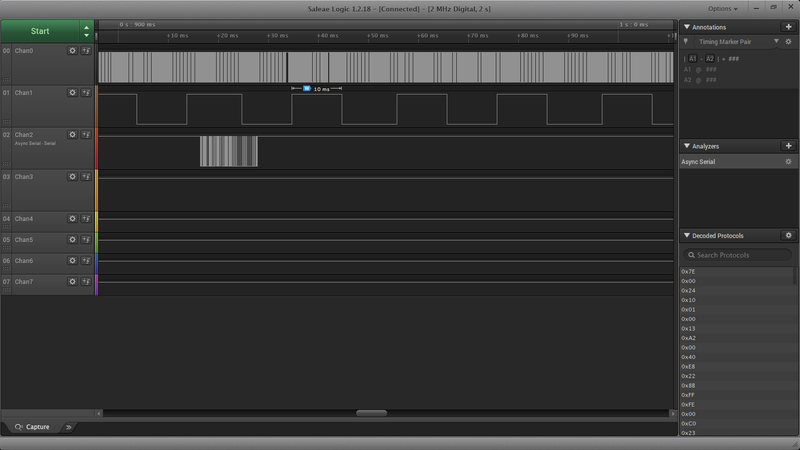 The top four traces are the SPI line to and from the modem on teh transmitter side. 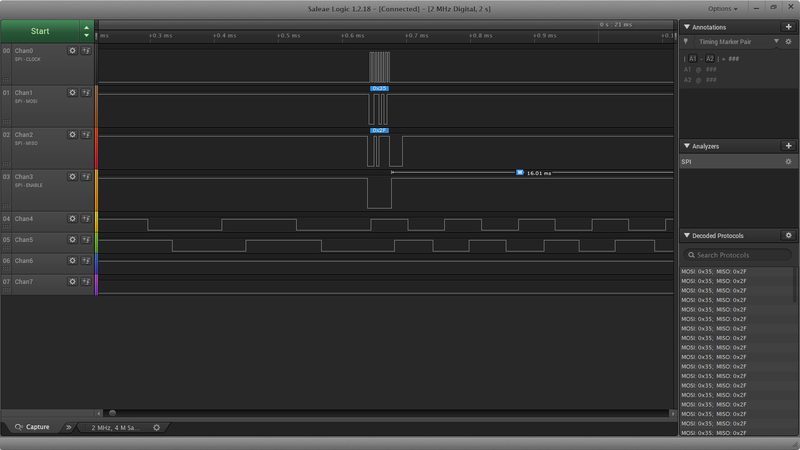 The bottom two lines are the transmit side DCC signal and the receiver side- they line up perfectly. Just blasting DCC over the air is a pretty brute force way to do things but it does work quite well and is fairly east to duplicate. 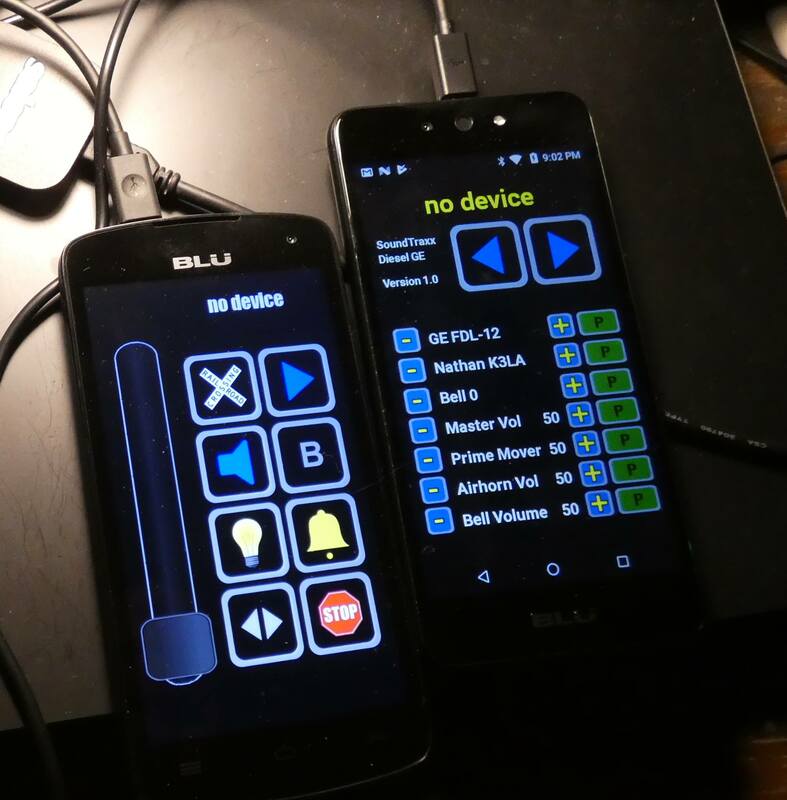 I got bored with Bluetooth and decided it just wasn’t going to give me what I wanted in terms of a control network. 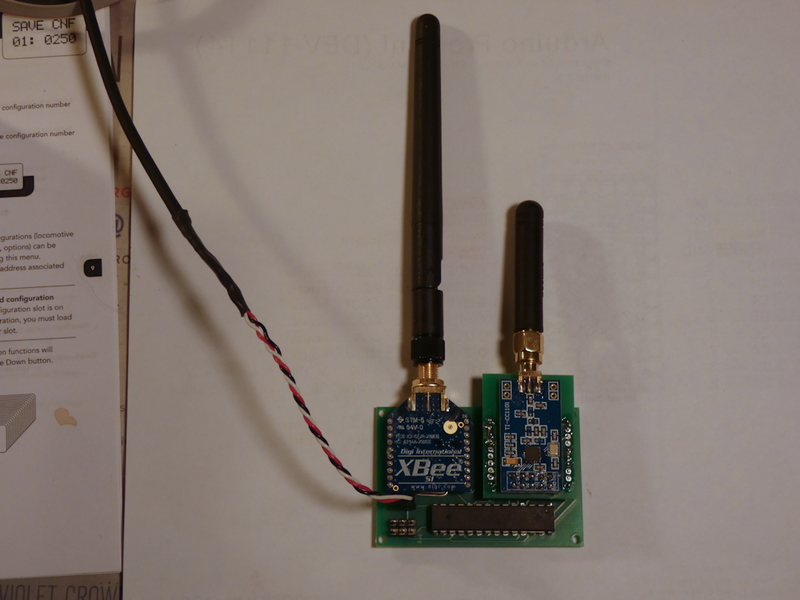 So I figured I would go back to one of my favorite wireless control devices, Xbee. I love those little blue boards. Since Xbee offers the Digimesh option for it’s devices I upgraded all my modules to the latest firmware and started designing some stuff. Above is the basic Airwire to Xbee breadboard. 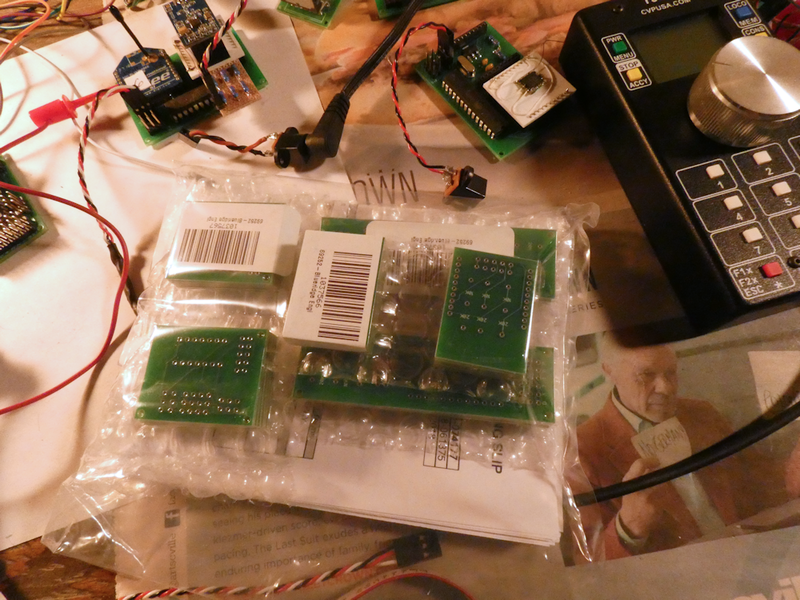 The ‘translator’ is a PCB that contains an Xbee in one socket and a CC1101 radio modem module in the other. The Airwire modem is mounted to an ‘Xbee blank’ that I cut out on my Probotix Router, this will be a PCB at some point. 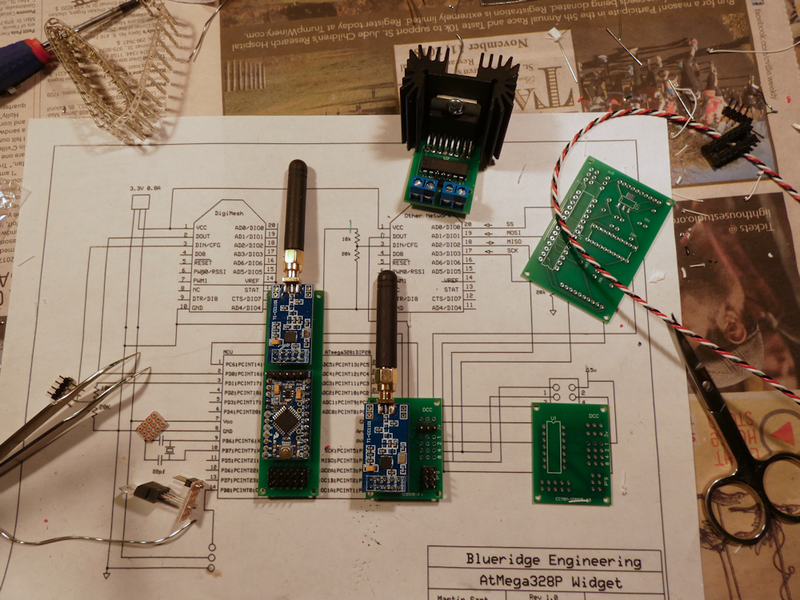 All of this is controlled by my favorite microcontroller, the Atmega328, the same chip in the Ardunio Pro Mini. 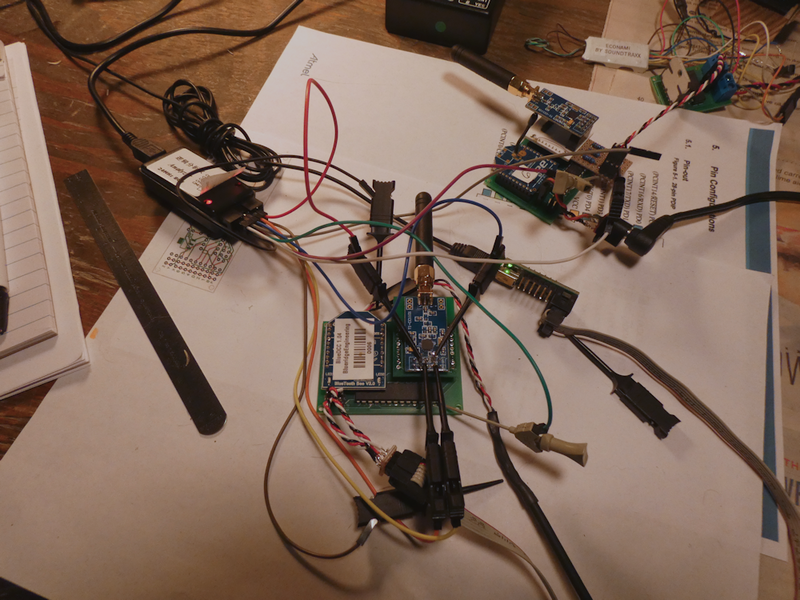 I clocked it at 16Mhz and implemented a priority scheduled bare bones RTOS to handle the various control tasks. 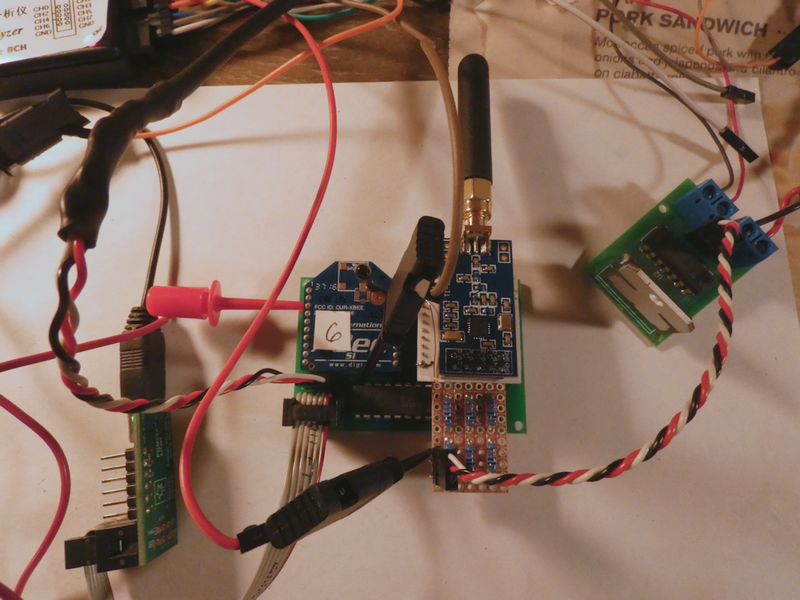 What I am doing is intercepting the DCC data streaming from the Airwire Throttle (many thanks to Eric Reuter for his radio init data) and breaking out the DCC messages into individual packets. 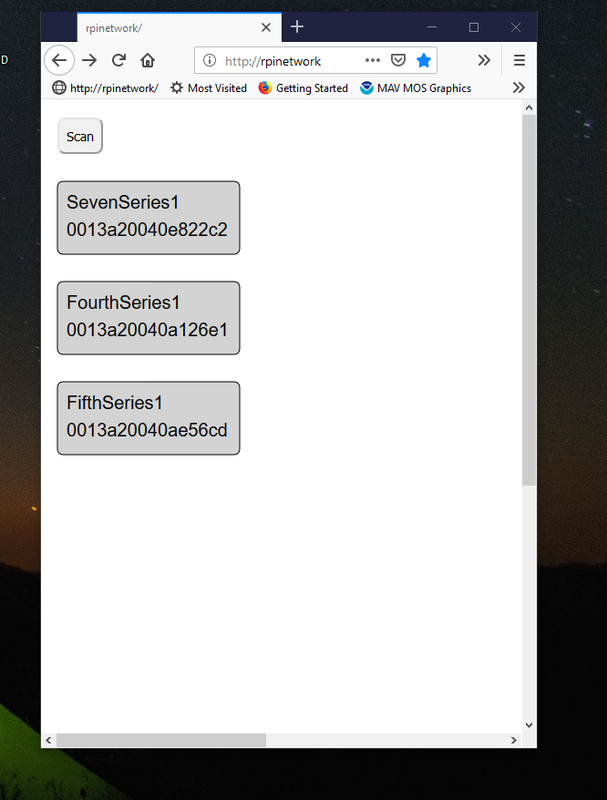 This lets me filter out the constant barrage of redundant messages and encapsulate them into Xbee message payloads. Only when the data changes is an Xbee packet sent out. 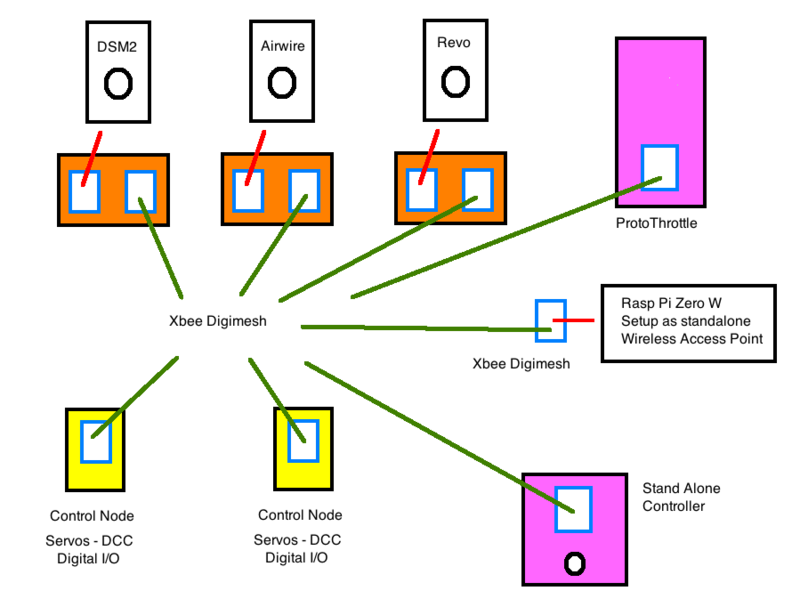 This is the basic network layout. 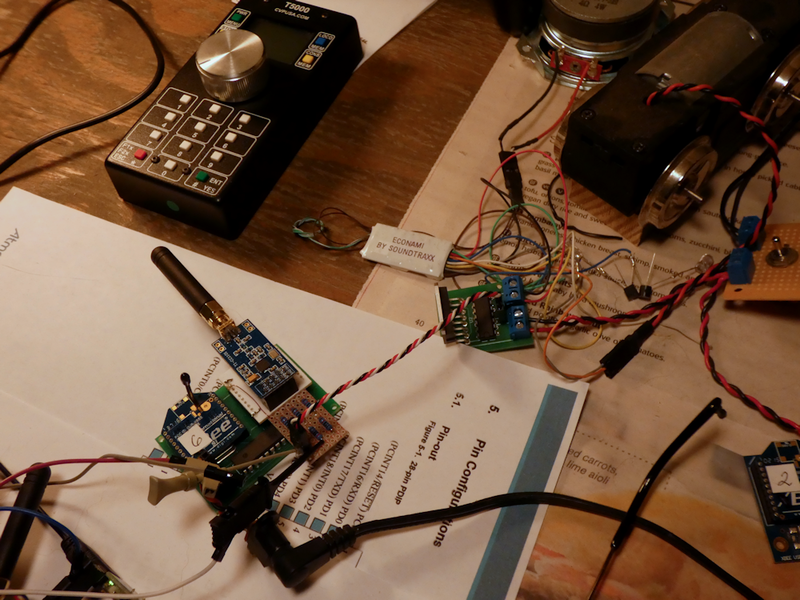 ‘Translators’ intercept the various control packets from handheld controllers, translate those control messages into a standard list of Xbee payloads and ship them off to the destination. Since there really isn’t a ‘master’ or ‘slave’ on a mesh network, these messages can also go to multiple recipients. There are all sorts of possibilities here using a single standard wireless message transport system like Digimesh. 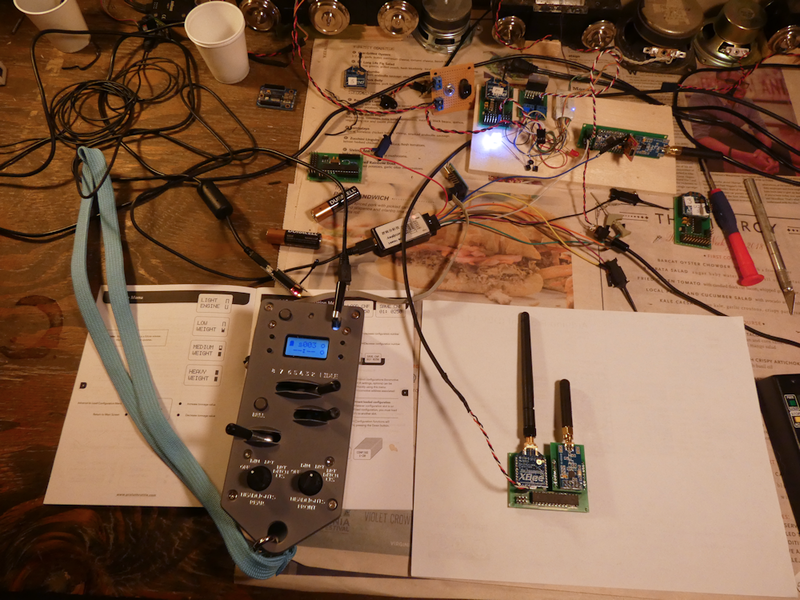 Above are the pertinent observations – logic trace and reception of the Xbee packet on the PC via XCTU. Top trace is the DCC from the Airwire Throttle, second is one of the RT clocks, the 10ms one, the bottom is the async data frame to the xbee. There is still much work to be done but the basics are now in place. I can convert all of my various control methods, Airwire, DCM2, Bluetooth, etc into a single, point to multipoint Industrial IoT mesh network. Xbee digimesh is very well document and pretty much an industry standard. And if you are doing just general train driving its fine. But for switching or live steam on grades, it’s not so great to run a slider with your thumb. 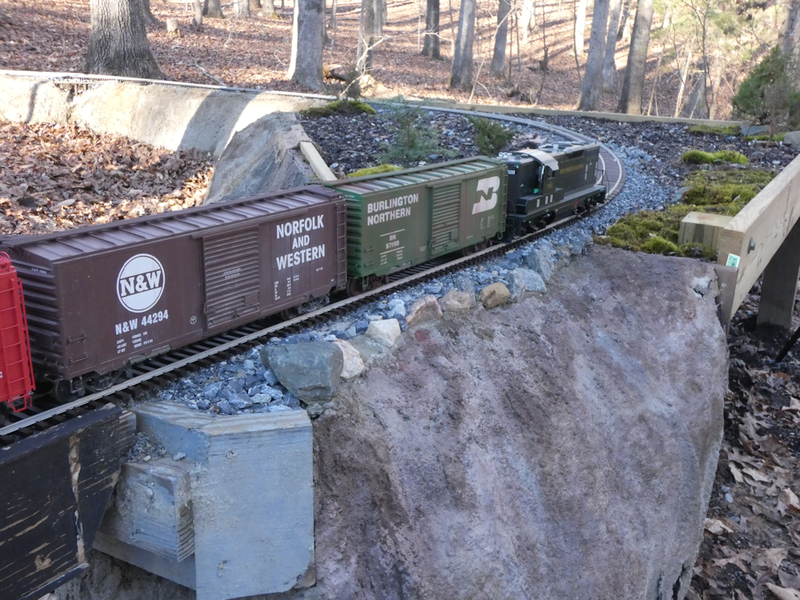 The live steam one was particularly difficult, you have to keep your eyes on the locomotive and also keep track of the slider. I found that to be quite difficult at times – I need a knob I can feel under my thumb. So I decided to start with Airwire since its very popular and they make a nice handheld unit with a knob. The Rpi Zero W, with the right configuration, can operate as a standalone Wifi Access Point with it’s own dedicated web server. (in this case, flask and python along with a little SVG for the web page interface). Just add the access point wifi to your phone or (his pic) your PC, and you can then display and configure any node on the digimesh network. Very cool. Here is a quick page I made up that does a network query on all Digimesh nodes it can find and displays a small box of info about each. Anyhow, this is just the beginning but it gives me a new set of toys to play with if nothing else. I’ll try to put together some sort of open source project for this once I get it working. The airwire modem is like $10, an Xbee is about $17 and the Raspberry Pi Zero W is $10 so this should be a relatively low cost control system. 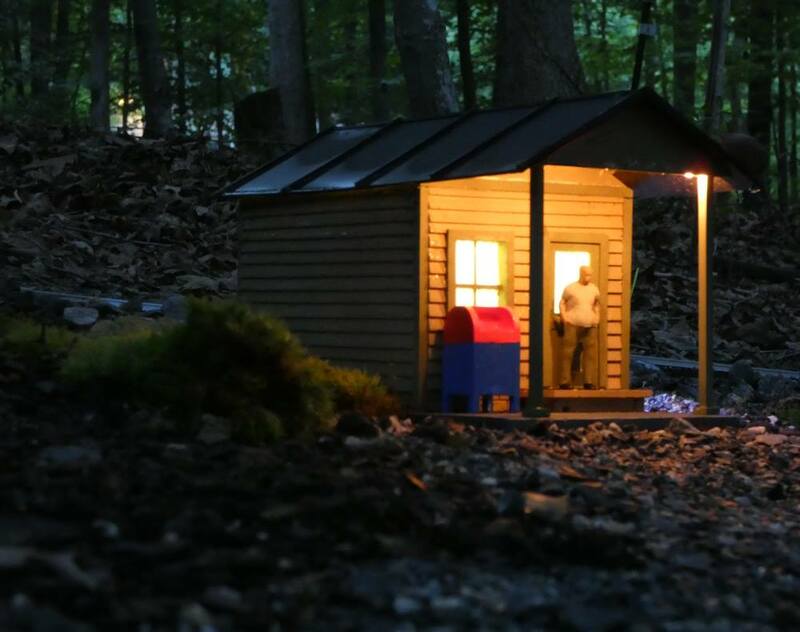 I originally built this as an office for the RV Park but it doesn’t seem quite right in the role, so I made it a Post Office in my new town of Proffit VA. I’ve got it installed and wired into the solar grid.